"Hot Run, but then the beach"
Disclaimer: I received free entry to the Virginia Beach Rock 'n' Roll Half Marathon as part of being a BibRave Pro. Learn more about becoming a BibRave Pro (ambassador), and check out BibRave.com to review find and write race reviews! I had the chance to run the Virginia Beach Rock 'n' Roll Half Marathon on September 2, 2018. I have previously ran the D.C. Rock 'n' Roll Half in 2014 and 2015 so I was excited to visit a different city and course. I drove down to Virginia Beach early on Saturday morning. It was Labor Day weekend, so even though I left early, there was still a ton of traffic. What should have been a three hour drive turned in to six hours. Regardless, I arrived with plenty of time to hit the expo. The expo took place at the Virginia Beach Convention Center. Packet pick up was quick and seamless. I got my bib and shirt and then went to explore the expo. There were about 50 exhibitors, but not much really caught my eye. I bought a pair of socks from the main merchandise area and then went in search of some Huma Gel. No one was selling any, so I settled for some Sports Beans. I was in and out of the expo in about 15 minutes. Because of my original hotel cancelling my reservation and not letting me know, I was not staying on the boardwalk where the race was to start. The hotel at which I ended up was the Virginia Beach Resort Hotel and Conference Center, about 20 minutes away. Luckily, it was still on a beach, just not the main beach. I left my room about 5:30am and arrived at the parking lot on 19th Street a little before 6am. It was a bit crowded trying to get in the lot as they had to collect $10 from everyone. But, I was able to get a parking spot and use the bathroom before the race. I even had time to go on the beach and watch the sunrise! Which, is totally magical. I finally walked over to the start line, found my fellow BibRavePro, Vanessa at She Runs by the Seashore, and wait in my corral for the race to start. The course begins right on the boardwalk, where you run for about two miles. Then, there is a small bridge before entering a more residential area. There was a man with a parrot cheering us on. This area was nice because the road was tree lined and there was shade. It was a straight shot for three miles before turning a corner and making our way back. Miles 7-9 were terrible. I did not enjoy running through Camp Pendleton. It was getting really hot, and there was ZERO shade. These were my slowest miles. Once back on the main road, my pace slightly improved. There was more shade, and some neighborhoods were passing out popsicles. There were also some sporadically placed sprinklers that helped cool you down. Running over the bridge once again, you turn and head toward the beach area. The finish is along the beach, where there were a bunch of people cheering. There were 13 stages set up along the course. There was a variety of music from alternative, classic and punk rock to blues, jazz and soul. Even with all the music, I thought the "rock" was lacking. I was really hoping for more dancing music, but there were really only two or three bands that got me energized. I also think the volume could have been cranked up a bit more. There were a lot of spirit teams cheering us on, and I appreciated that. The dancers and cheerleaders were motivating and fun to watch as we ran by. Finishing the course, you run through the shoot and then get your medal. Keep walking and water and food was available. Options included Gatorade, chips, chocolate milk, hummus and pretzels, and bananas (which were way too warm and mushy). There was a merchandise area, a beer garden, and some musical acts. "Pretty much a MUD run!" 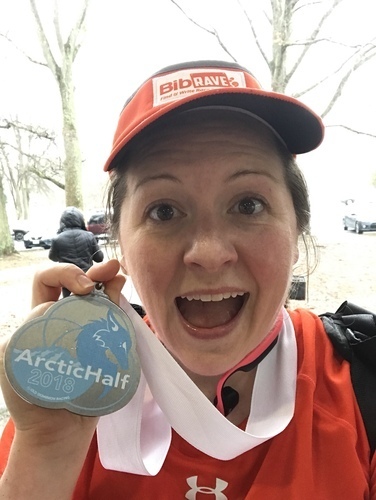 The Old Dominion RacingArcticHalf took place on February 24, 2018 in Sterling, VA. The ArcticHalf took place at Algonkian Regional Park. There was plenty of parking and the start packet pick-up and start line took place under a covered pavilion. This was great because it was raining before the race began, and I was hoping to minimize my getting wet prior to the race. The line to pick up my bib and shirt was quick, and I was grateful that the race shirt was a long-sleeve tech shirt. I definitely did not bring enough warm clothes to the start. There were a few port-o-potties at the start, as well. Prior to the start of the race there was a quick warm-up from Orange Theory, with some fun dance moves and stretches. Then, it was time to begin. There were multiple-race distances for this race. The Half Marathon began at 12pm, which was a nice time because I didn't have to wake up super early. The 10k started just before 1pm, with the 5k following that. The day called for rain. Which is fine, whatever. It rained while driving to the race, and up to the start. It was chilly, so I was glad for the long sleeved tech race shirt. The rain conveniently stopped right as the Half Marathon was starting, which was perfect. I ended up taking off my long sleeved shirt during the half mile because it was starting to warm up. The course was mainly dirt trails, with a few stretches of pavement and gravel. Unfortunately, because of the rain, the dirt trails were mostly mud trails. Again, whatever. I was being very cautious, though, because I have been known to trip and fall on dry trails. This mud trail was nothing like I have ever experienced before. I have ran in the rain. I have ran in the ice. Mud is a while different animal. No only is it hard to run because you don't want to slip, there is the extra added resistance of sticking to the ground. Seriously, there were parts of the trail where I had to hold onto trees or walk slowly with my arms straight out to help balance. Regardless, this was a great course. You start off with one lap of two different trails, before heading past the golf course to a gravel trail. After a bit on this trail, you turn around and do a second lap before ending. Most of the course was in the trees, with some views of the water. It was very pretty! Parts of the course were flooded, so we had to wade, step on rocks, or jump to cross! The long sleeved tech race shirt was great and definitely helped to keep me warm pre-race. The water stops were stocked very well with water, Gatorade, Sports Beans, Gu chews, and hand warmers. The medal was nice and heavy and a good quality. The finish line had fruit, pastries, coffee, hot chocolate, and root beer (which is what I chose, along with some fruit). Never has a root beer taste so good. I know understand why a lot of races end with beer! There was a raffle for a TV, Garmin, and other running gear. You were to earn tickets based on which race you completed, as well as if you helped to raise any money. Unfortunately, they started the raffle when I was at mile 10 and was over by the time I finished the race. I wish there was a way to have had my raffle tickets in the pot so I could have been considered to win. I hadn't run a half marathon since October, and I wasn't quite yet trained for 13 miles. However, I have been doing some training runs and races in preparation for the Blue Ridge Marathon in April, so at least I had been doing some running. My intervals were run 1, walk 1, which I tried to follow when I could actually run. However, the amount of slick mud made it hard for me to run consistently on a lot of the trail, so I was a bit slower than I wanted. But, I felt great! Except for a blister forming on each pinky toe (due to wet feet), I felt like I could have kept running, which is a positive because I have some longer runs coming up! My finish time was 3:16:37. 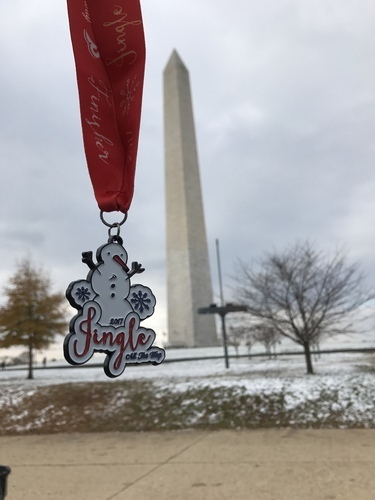 "2017 Jingle All The Way 15k"
The Pacers Running Jingle All The Way 5k & 15k took place on Sunday, December 10, 2017 in downtown Washington, D.C. I knew this would be a good race because it was festively themed and Pacers always has good races! The morning of the race I drove to Arlington and parked at the Pentagon City Mall. From there, I ordered a Lyft to take me downtown. The metro wasn’t slated to open until 8am, and I didn’t want to have to deal with finding a parking spot before the race. My ride to D.C. was quick, and I arrived at the National Monument about an hour before the 15k race time. I did not pick up my packet before the race, so I got in the line for bib pick-up. It was a little before 8am at this point, and they wanted all of the 5k people to come to the front of the line. Understandable, but it was slightly annoying to have to just stand and wait for all of those late comers. Finally, I got my bib and picked up my awesome winter hat. There was a row of port-o-potties at the race start, but there was also a few stalls of indoor bathrooms. There was no line for the bathrooms, so I was able to use them twice before the race began (just in case!). The 15k course included two out-and-backs. We started at the Washington Monument and ran towards the Kennedy Center before turning around and heading to Haines Point. After that, we headed past the Washington Monument again for about a mile and a half until heading to the finish line. The course was especially pretty because of the freshly fallen snow the day before and for the fact that the race ran next to the water for most of the course. There were three water and Gatorade stops for the 15k, and one stop for the 5k. At the end of the race, I went to collect my medal, a bottle of water, a heat blanket, and a banana. They were also handing out donuts and coffee. I heard rumors that there was also hot apple cider, but it was all gone by the time I finished. Our bib also had a ticket for a free burger from Shake Shack! "It was cold...and I over-dressed :("
Packet pick-up is super easy at Bishop's Events races. An hour before the race starts, you can grab your bib, shirt, and other goodies. The parking lot is right there, so it is easy to throw your shirt in your car without wasting any time. Another good thing about the race being at Old Mill Park is that there are indoor bathrooms! Hooray! Starting at Old Mill Park, the course takes you through the parking lot, to the bike path one direction before turning around. You then reach the Rappahannock River and follow this until the 5k turn-around. The 10k course continues along on the bike path through a wooded area, before their turn-around. 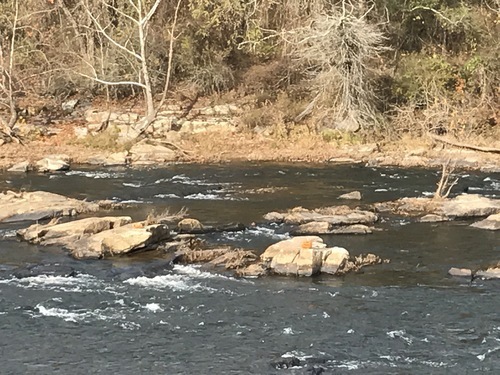 The river was excited today because someone had place some jack-o-laterns on the rocks in the middle of the river! I signed up for and planned to run the 10k distance. I started with the 10k runners, but quickly knew that I would need to drop down to the 5k. Luckily this was easy to do as the 5k and 10k are the same course, with the 10k just being extended before you turn around. The weather forecast called for low 30s, so I dressed appropriately (or so I thought). I totally OVERDRESSED, and not in a way that I could strip down mid-race. As this was the first cold race of the season (and I didn't run last winter), I forgot the best way to dress. Lesson learned. Another problem I was having was that my mind was just not focused to be running. I guess this happens sometimes. Regardless, I finished the race in 42:23. Definitely not my best time, but stuff happens. At least I still got out and ran! The Prince William Half Marathon was held on October 1, 2017 in Bristow, VA. The race was close to where I live, and I knew a lot of people who were running it. My dad and I signed up for the race earlier in the year, with full intention of training. However, life got in the way. 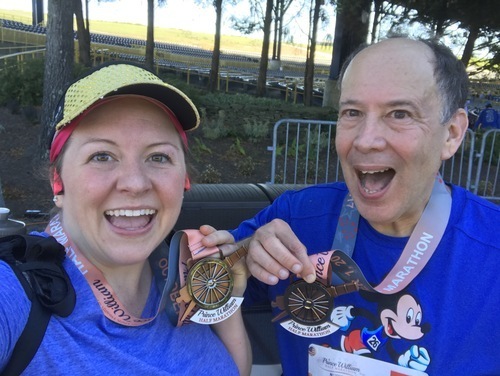 I was only slightly trained (with a progression of three race weekends leading up to the race: Memorial 5k, Glowstick 10k, and the Clarendon Day Run Double), but we decided to run the race anyway. Packet pick-up took place two days before the race at the Freedom Center in Manassas. This is on my way home from work, so it was easy to get to. I was in and out in just a few minutes. There wasn't much to look at, except for a few race items such as clothes and pint glasses. 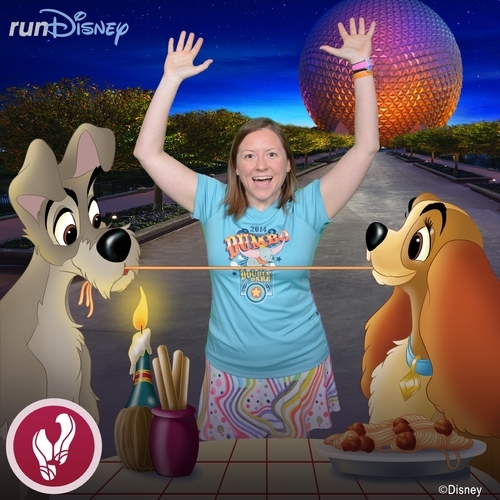 I was lucky to get there on the first day so I could exchange my race shirt size (since the shirts ran extra, extra small)! The Prince William Half started and ended at Jiffy Lube Live. There was plenty of parking in the huge parking lot, but traffic to get in the lot was very long. We pretty much made it just in time to put on our shoes, go to the bathroom, and make it to the corral for a pre-race photo before the race began. It was good that we didn't have much extra time because it was pretty chilly before the sun came up! The course was on all paved roads. It took you from Jiffy Lube Live over an overpass and onto the roads that go through the Manassas Battlefield. While running, we passed the Stonewall Memory Gardens, a few monuments, and lots of hay bales. The course was a bit hilly at times, but only in shorter spurts. There were a few out-and-backs so we always saw other runners and didn't feel so much as back-of-the-pack that we were. There was a high school marching band and cheerleaders cheering us on during the first and last mile, which was very helpful for that last stretch of road. After the race, we grabbed our water and banana and headed to see what food was being offered. We received a drink ticket and a food ticket. Unfortunately, both Moes and Tropical Smoothie were considered food. I opted for the smoothie, and luckily they agreed to make me one without yogurt. We did not stay for the music as we were tired and wanted to leave. All-in-all, the Prince William Half is a well put-together race, and I would run it again if I had someone to run with.